Millennials grew up with preordained design. It was decided at birth that we would not work, but would instead be educated with the sole intention of attending university. Any other path would not measure up to the standards of society. In elemantary school, we learned of our identity as special snowflakes. Free play was exchanged for structured social events, with assigned activities and playmates. Competition was “discrimination,” instead, everybody got an award for participating. In High School, courses were catered towards taking the SAT’s. Woodshop, home economics, and other courses based on practical life skills had all but vanished from the curriculum. Our parents worked hard to send us to college so that professors could tell us how bad we truly were. History was rewritten, and good grades required regurgitation of the professor’s politics. Safe spaces stiffled dissent, and the counter-culture progressives became the dominant culture, establishing themselves as the new bullies on campus. Students were issued separate credentials for debate. The word “priviledge” was used by professors to discredit dissent. White men were effectively not allowed to debate, only being allowed to speak if it was to cheerlead our declining influence. Academic succes became mutually exclusive with self-hate. Outrage culture and pathological victimhood consumed the worldview of most millennials. Merit and reason became irrelevant. Then we became adults, and people wondered why so many of us became socialist. We’re a population engineered not know how to function without an eternal supervising parent figure, and the Democrats are gleeful at the opportunity to play that role. The Wall Street Journal recently printed a hit-piece by Ben Fritz, slandering YouTube’s most popular creater, PewDiePie. Fritz did little work in trying understand the context of the jokes that were made, falsely attributed motives, and did not ask the creater himself for comment. This facilitated a media firestorm that led to the loss of sponsorships for the YouTube celebrity. Instead of reading Ben Fritz’ body of work, asking for comment, or doing anything of journalistic substance or integrity myself, I’m just going to slander him, for the clicks. Becasue being outraged at a persons commedy that you don’t find funny means that you should do eveything in your power to ruin the livelyhood of that person. So here are a few out-of context, tasteless jokes by WSJ writer and moral purist, Ben Fritz. A new Massachusetts law levies a 20-cent fee from each car ride hailed by an app service. Five cents will go towards the needs of traditional taxi services, ten cents will go to cities and towns, and the last nickel is designated for a state transportation fund. Uber and Lyft alone facilitate a combined 2.5 million rides per month in Massachusetts, which means millions per year for the Commonwealths crony, MassDevelopment, that will be figuring out how to spend the money that ride-sharing companies make. The law states that the money will be used to help “new technologies and advanced service” for the traditional taxi industry. Which means reallocating resources to encourage driver hospitality and an app service for hailing taxi cabs, the two things that set companies like Uber and Lyft apart from traditional taxi services. “I don’t think we should be in the business of subsidizing potential competitors,” said Kirill Evdakov, the chief executive of Fasten, a ride-sharing service that operates in Boston. Instead of endorsing the Republican nominee, Ted Cruz has insisted that the American people “vote their conscience.” He may get his wish, but he likely won’t personally benefit from the consensus of the modern conservative conscience. 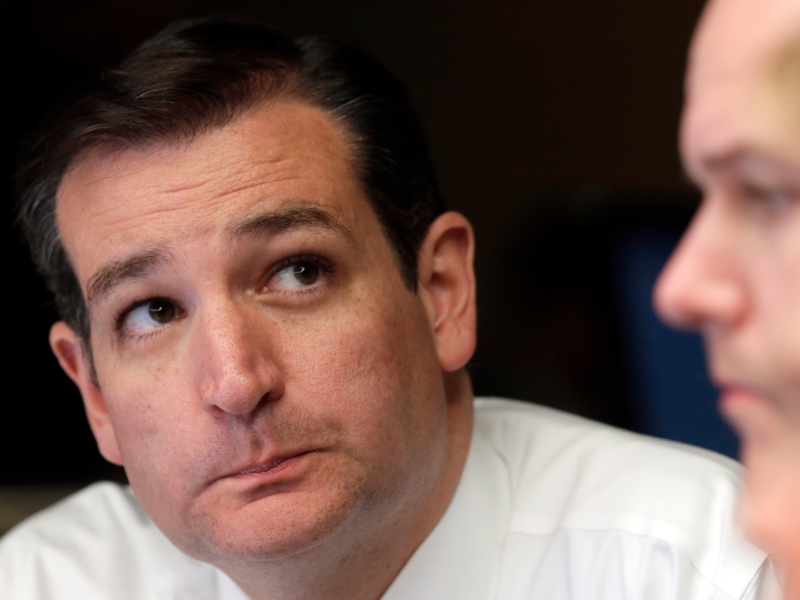 In Texas, Cruz’s senate seat is in question. In a poll involving 994 “likely voters,” 46% said they would vote for former Governor Rick Perry, versus 37% that said they would vote to re-elect Senator Cruz in 2018. Ted Cruz started his Presidential campaign in the spring of 2015 with $6.3 million. He was able to transfer $2.9 million to another committee for his senate race, but has had to return $2.6 million in contributions to former supporters who requested a refund. Cruz now has $612,438 cash on hand and $604,885 in debt, which leaves him with a whopping $7,553 for his anticipated presidential campaign in 2020. During Obama’s time on the throne (February 2009-July 2016), the US Department of the Treasury has collected nearly $20 trillion in taxes. During that 90 month period, the federal government still mustered to incur $8.8 trillion in debt. Moral arguments about the ethics of taxes aside (tis theft cough cough), this gross misallocation of resources has sucked the life out of the economy by subsidizing less efficient sectors. This effect is largely unseen, for the government is essentially taking away market progress and innovation that would have been created by the efficient use of twenty trillion dollars. While it may be a stretch to say that Hillary Clinton is the founder of ISIS, she has indeed armed the Islamic terrorist group and then lied about it under oath. This is confirmed by documents obtained by Wikileaks. In 2011, weapons originally obtained by the State Department in Libya in order to overthrow Gaddafi, were sent to Syria in an attempt to arm anti-Assad forces. In 2013, Senator Rand Paul questioned Secretary Clinton over the rumors that weapons were being funneled from Libya to rebel groups surrounding the Syrian capital. At the 2016 Warsaw Summit, NATO has pledged four more years of war in Afghanistan. The US invaded Afghanistan in 2001, and has occupied the country for the last 15 years straight in what has become longest war in US history. The police are going through a public relations nightmare. Perception of policing is increasingly seen as threatening rather than helpful. This is largely due to the proliferation of murders carried out by police officers that have been captured on video. When a police officer in the America murders somebody, other officers mostly attempt to protect their own brand and badge as best as possible. In any other industry, colleagues and competitors in the same field would denounce the actions of an individual who operated outside the rules of conduct.